Melodiya's relatively extensive reissue programme fortunately takes in sonata recordings made by Yuri Bashmet and Mikhail Muntian of both studio and live material. The Schubert Arpeggione Sonata was recorded in the studio in 1977, whilst the two Brahms sonatas followed in 1984 in live inscriptions made in the Great Hall of Moscow Conservatory. They were works to which the two men returned with some alacrity after their contract with RCA was established. The Schubert can be found on RCA RD60112, whilst the Brahms sonatas, coupled with the Two Songs with Viola, Op.91 are on 09026 63293-2. There are few really noticeable interpretative differences. In the RCA Schubert he takes the first movement repeat, which is an improvement on this Melodiya where he jettisoned it. But not in doubt are his big, elegant and subtle tonal gradations, the excellent legato, precise calibration of bow weight and also - sometimes overlooked with him and Muntian, since they are very focused artists, not given to showy gestures - the buoyancy and wit they find, notably in the exchanges in the first movement. There's a huge amount to admire here, not least in the light lyricism of the slow movement and the life-affirming finale. 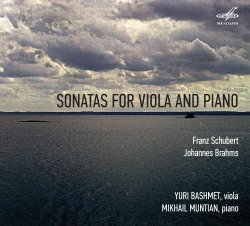 Violists and cellists can vie for this sonata as much as they like, but when Bashmet plays it there is always an extra quotient of refined musicality to be heard. That is the case, too, when it comes to the companion Brahms sonatas. There's no doubting the appassionato element in the opening of the F minor, played with sweeping grandeur and fine attention to detail, spurred on by the sportive nature of a live recital. There's truly beautiful phrasing here, and a warmer, richer tone to be encountered in the Adagio, a few tiny imprecisions aside. With a confident and proportioned finale the communicative and collaborative nature of the music-making is fully to be relished. They really are a true duo, and merit the applause that has been retained. The E flat major is similarly impressive and perhaps at its apex in the central movement, where the vitality and sparks-flying drama to be heard is more overt than one would have encountered in the studio. Yet there is no want of pliant and sensitive phrasing either, nor does Muntian lack power in the finale where he matches tonal reserves with Bashmet but never overparts him. These strong readings are thoroughly persuasive and make excellent alternatives to the studio Brahms recordings on RCA, especially if you appreciate the frisson of live performances. Let's also, finally, take a brief moment to salute Muntian, a true collaborative artist.